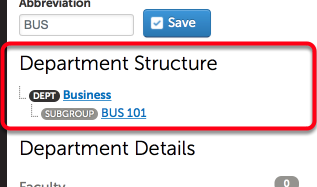 Department Subgroups provide you with an additional level of organization in Chalk & Wire. Subgroups can be used to quickly and easily send Forms or notifications, to limit the accessibility of a Table of Contents, and more. 1. Use the Actions menu to select Add Subgroup. 2. Enter a Name for the Subgroup. The new subgroup will be listed on the Edit Department screen under the Department Structure heading.